Back in June Creative Carbon Scotland advertised an opportunity for a local artist to craft this years Fringe Sustainable Practice Award. Those of you that know the award well will remember the original piece of paper we gave to award winners at the live ceremony. Things progressed from there and we presented our winners with a beautifully carved wooden plaque. 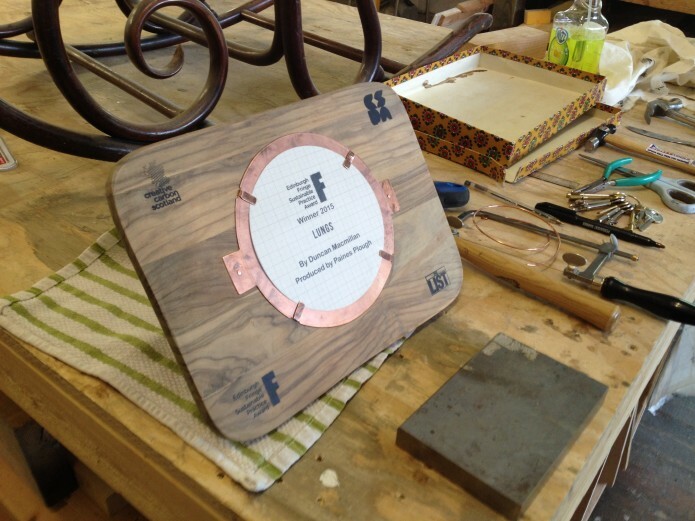 This year however, we wanted to present the winner with a hand crafted award piece that took into account the ideas and aspirations of the Fringe Sustainable Practice Award. After sieving through all of the proposals, we commissioned Sarah Diver Lang, a printmaker and graphic designer working from Process Studios. The award piece Sarah crafted was beautiful. We therefore wanted to share the story behind its creation, and talk a bit more about Sarah herself. The concept of the award was to use only found or recycled materials to reflect the spirit of sustainability. Sarah sourced her materials from local areas including Sam Burns Yard in Prestonpans, various car boot sales, and gathered objects from her studio collection. The award consists of wood, copper, glass and graph paper. Graph paper was used to highlight the process of planning that goes into a sustainable production. The idea of using mixed materials was proposed in the hope that the materials, over time, would react with one another, reflecting our changing attitudes and response to dealing with sustainability. Only hand techniques were used, without glues or electrical machinery, to keep the energy used to create the award to a minimum. Sarah used a screen print technique to print logos and the crucial winners information onto the wood and paper. We asked Sarah what it was that attracted her to the award? And, what other sustainability initiatives she is engaged with? For more information on Sarah Diver Lang and her other inspiring projects, check out her webpage here. The 2015 Fringe Sustainable Practice Award for sustainable design, content and production at the Edinburgh Festival Fringe, was awarded to Paines Plough for their production of Lungs, written by Duncan Macmillan, and performed at the Roundabout at Summerhall. For more information on Lungs, see our blogpost here. The post #GreenFests: Meet Sarah Diver Lang, the crafter of the 2015 Fringe Sustainable Practice Award appeared first on Creative Carbon Scotland.